… So, what’s the Rubber Band about? Consider, first, when a Visionary and an Integrator walk into a bar, it’s likely they will order different types of adult beverages. Visionaries and Integrators are just that way – different. Sometimes, this relationship is close and harmonious, and yet, sometimes it can be very different, especially when the Visionary won’t let go, won’t let the Integrator be the deciding factor for the Leadership Team. Coincidentally, sitting in a (unrelated to EOS) conference next to a Visionary, the conversation ultimately morphed into both EOS and the V/I relationship. This particular Visionary was wrestling with seemingly different views on the roles and, perhaps indicative of his High D behavior, was using his hands linearly to describe where he, as Visionary, was perplexed. He said, “the Integrator was pulling too hard and was trying to usurp the Visionary’s forward-looking decision making, his executive privilege,” as it were. Attempting to ‘talk him off the ledge,’ I reference his hands in explanation, and thus forming, at his suggestion, the germination of this blog. Imagine, first, the picture – the hands represent the Visionary and the Integrator. 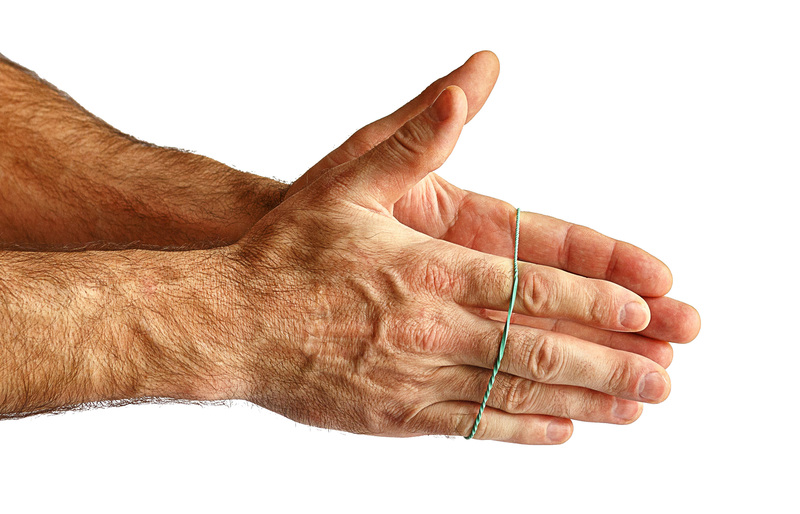 Each hand, individually, stands alone yet are, collectively, bound by the rubber band. The rubber band is emblematic of the dynamic tension existing between well-functioning Visionaries and Integrators. Each pulls the other – to another product/service line, to more focused efforts, or to a different, improved position. This ‘dynamic tension’ creates a better position/outcome, forcing each to challenge the other and grow while the tension keeps them together. Without being on the same page, if either pulls too hard and apart, like the person in the situation above, the relationship snaps, just like a rubber band, and the dynamic tension is lost. Trust is broken; the rubber band snaps. In contrast, pulling not hard enough forces the Visionary and Integrator to be too alike, simply a mirror image of one another. Neither of these later two positions serve the organization well. Consider the power of EOS and the Same Page Meeting, from Rocket Fuel, where each month the Visionary and the Integrator spend four hours getting on the same page. Get on the same page, and allow the dynamic tension – the pulling on each other – help focus your efforts. How is your relationship and the organization benefiting through dynamic tension?